I just got Venus 1500 V4… Now What??? We thought, now’s a good time to blog about getting started using your Venus 1500 V4 software! Register your software: How do I register or license the Venus 1500 v4 software? Configure your software: How to create and configure a Galaxy display in Venus 1500 v4. Download the Daktronics Media Kit: How do I download the Venus 1500 v4 Media Kit? Choose a Schedule Mode: How do I switch between Continuous Mode and Scheduled Mode in Venus 1500 v4? Visit the Venus 1500 Learning Center for self-guided training to learn about your new software at your own pace. The learning center includes helpful videos and tutorials. Both Venus 1500 V4 and Content Studio also contain Help Guides which can be found by simply clicking on the Application Menu (Orange V) in the upper left-hand corner of the software. Hover over Help and click on Contents. You can also click the little question mark in the upper right-hand corner. Remember, if you have any questions or problems doing any of these things, call Daktronics Software Training at 1-800-325-8766. We are available Monday through Friday from 8 a.m. to 5 p.m. CST. Search our Knowledge Base for a multitude of articles with step-by-step instructions to resolve any issues or questions. Click the Contact A Trainer button to reach out to one of our professional trainers with questions. They will call or email you back, your choice! To see Frequently Asked Questions and find other helpful support options, visit the Venus 1500 V4 Support page. 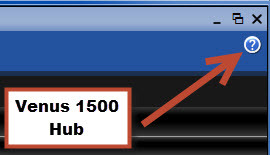 For additional support options and information, visit the Venus 1500 V4 product page. Visit pixlr.com for help resizing still images that may be too big for your sign. For those of you who made it all the way to the end of this article, congratulations! Here is a link to download additional FREE CONTENT PACKAGES from http://buy.daktronics.com!!! Thanks again for reading! Previous: Previous post: Digital Billboards. Do Smaller Cities Need Them?